You’re getting so much more than just a photographer. We are your wedding planner who helps you find the most epic spot to get married, your adventure partner, tour guide, and sherpa who helps you haul your essentials up a mountain. We’re your best friend and cheerleader who will zip up your dress & tell you that you look amazing (because you do). We’ll share everything we learned from designing and documenting 100+ elopements including what to do, what not to do, and everything you never even thought of! You’ll get as much help & guidance as you need to create your fully-customized dream elopement day that’s 100% YOU. Almost all of our work you've seen are in locations that our couples didn’t even know existed until they contacted us. We match every couple with the setting and location that’s just perfect for them. That’s why we send every couple we work with an elopement location idea list based on our extensive travel experience. We’ll also help you design, plan, and document the full story your elopement day. 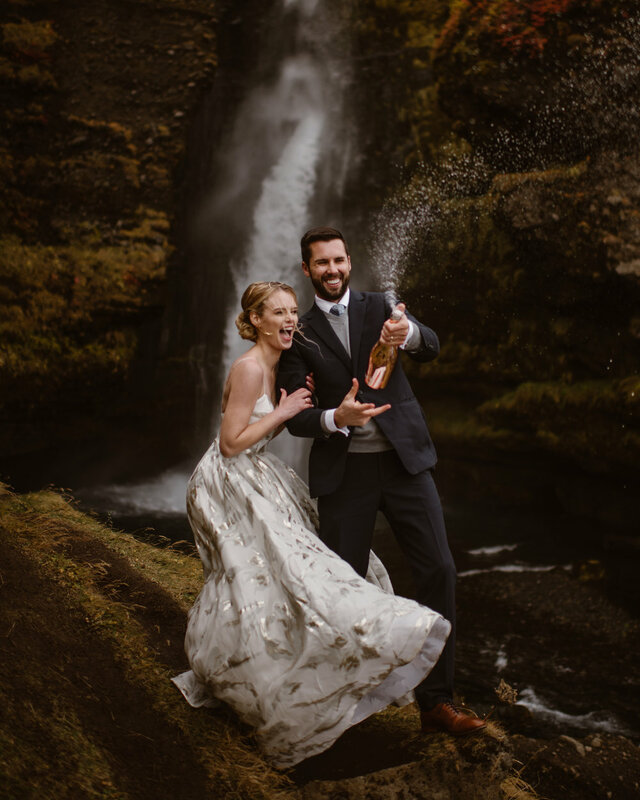 Because when your elopement day, location, and timing are just right—your photos turn out incredible! The point is, you deserve the best experience, and that's what matters most to us. Thousands of couples each year end up feeling regretful about having a wedding day that was too big, too stressful, too much of a performance, and too much about everyone else—and sadly, there are no re-dos. This is why we are so passionate about helping couples ditch the big wedding plans, and create an intimate, meaningful, intentional, stress-free wedding experience. 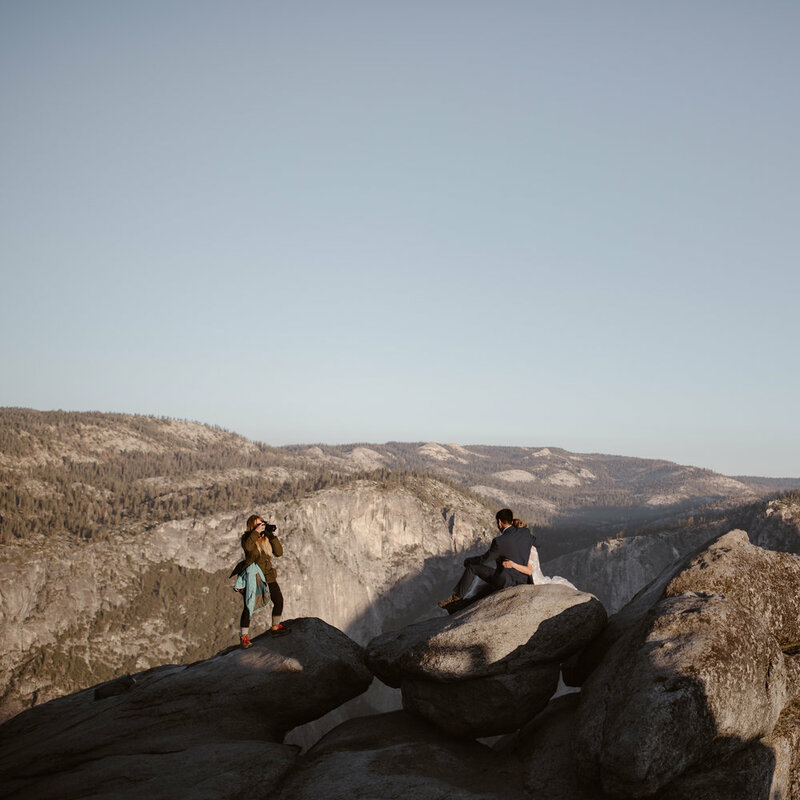 are you ready to start Planning Your Dream Adventure Elopement? LET’S TALK ABOUT YOUR DREAM ELOPEMENT! AN ELOPEMENT PHOTOGRAPHER & GUIDE? Hi! I’m Maddie Mae! I’m addicted to travel and adventure in new places—finding secret hikes and driving down unmarked dirt roads. My partner is from Scotland and we have traveled to a combined total of over 75 countries— I prefer tent-camping to hotels, public busses and walking to taxis, and sketchy street food to 5-star restaurants. 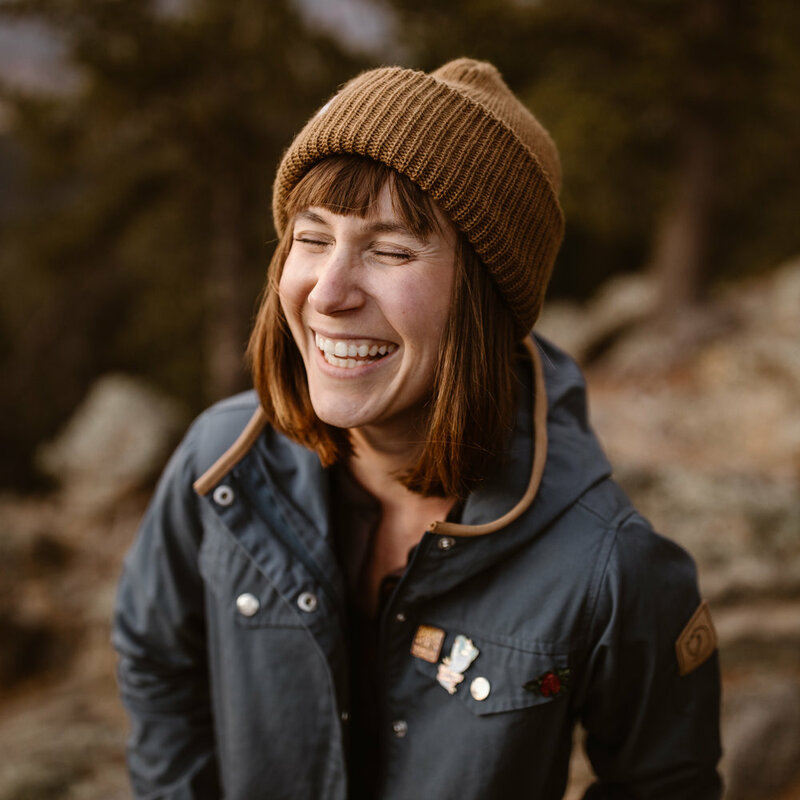 There’s no adventure too extreme or place too far to go for an adventure elopement—I have climbed 14,000 ft mountains, snowshoed up glaciers, and waded neck-deep in freezing rivers to document couples’ love stories. I believe that elopements are the best way to have an unforgettable wedding experience and I love empowering couples to make that brave choice to elope. I'm so excited to get to know you and plan an awesome adventure together. Hey! I'm Amber. My partner and I met while skydiving, and free-soloed the Second Flatiron in Boulder, CO on our first "date." Adventurous love stories are my favorite to tell, and I can't wait to hear yours. I’m happiest outdoors—sky diving, climbing, hiking with our two dogs (Olive & Cooper) or paddle boarding on high alpine lakes. Some of my favorite memories include tubing down rivers, a 20 day backpacking trip through the High Sierras, and zooming up massive sand dunes on ATVs. I love that elopements & intimate weddings let couples choose their own adventure and create a day that truly reflects them. I can't wait to chat with you and help you design a truly unique and intimate day that celebrates your relationship. Hi there! I’m Tori! The mountains have my whole heart and the outside my soul. I’ve hiked 300+ miles of the Appalachian trail, lived in a romantic medieval village in Provence, France while studying abroad, and spent 9 weeks in Thailand eating fresh mangos and motorbiking to a new snorkeling spot everyday. I feel most alive when I am waking up in a dewy tent on a mountainside, skinny dipping in salt water, and experiencing new cultures and foods. My husband and I eloped in Colorado on a snow covered mountain overlook surrounded by our closest friends and family and then spent the week skiing. Our day was uniquely us—relaxed, fun, and intimate. It was our dream day, and I cannot wait to help you create yours. My true love is my mini goldendoodle named "Fionn." He looks like a real life teddy bear but is actually a badass who climbs mountains with me. I’m bilingual, scuba certified, and wilderness CPR certified. 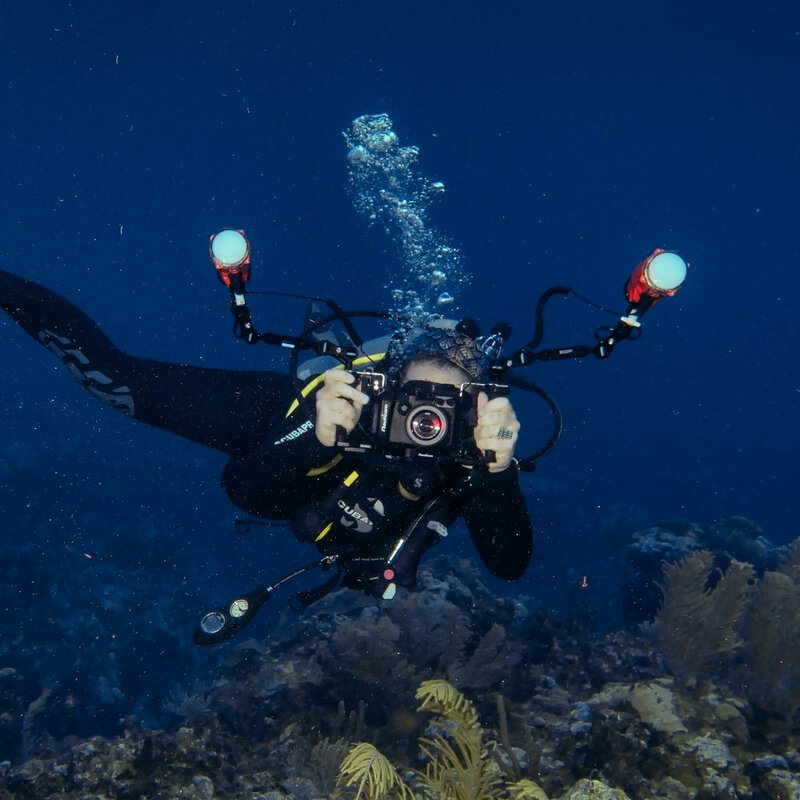 My dream is to photograph an elopement 100ft underwater. I'm also engaged and planning my own elopement—we're thinking of saying our vows near some ancient ruins in Peru! I could survive off of popcorn, Brussels sprouts, and samosas—mostly just popcorn. I’ve taken off in planes hundreds of more times then I’ve landed in them—skydiving is fun! I have two rescued pups, Olive and Cooper—rescues are the BEST! I fell in love with rock climbing after climbing for the first time outside Chiang Mai, Thailand. My current goal is to transition into mountaineering! I once woke up to a moose smelling me, while sleeping in the backcountry - true story. I have an insanely adorable fluffy Husky/Border-Collie mix named Murphy-ask me to show you photos of him...I have about 1000. Do you need help planning your elopement? This is YOUR day — and it matters. It will be your anniversary for the rest of your life and you deserve to look back on it and have no regrets. Let us be your guide and help you create your own wildly different wedding experience that is completely yours. 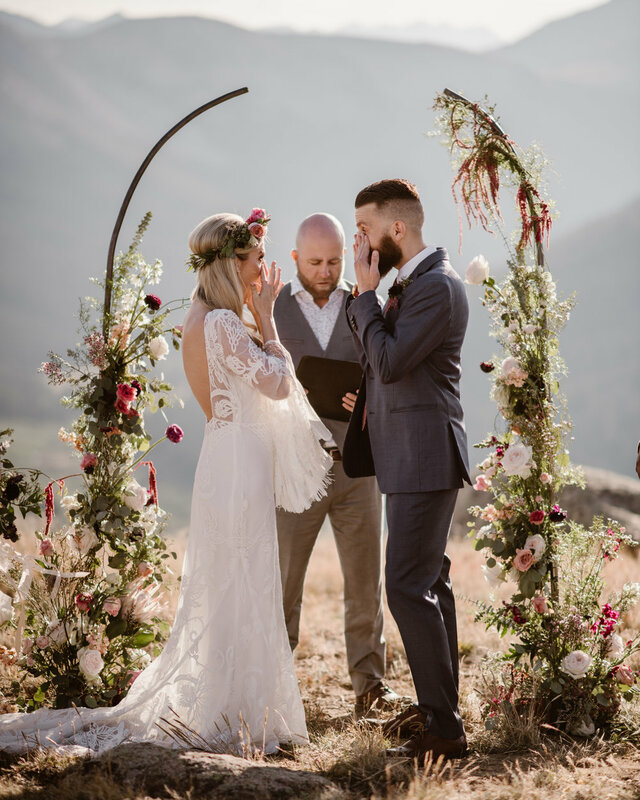 We are all ordained Officiants—We can sign your marriage license (in most states) so you can keep your elopement as intimate as possible. We are all CPR/First Aid Certified- you can trust that we’re experienced & prepared guides! 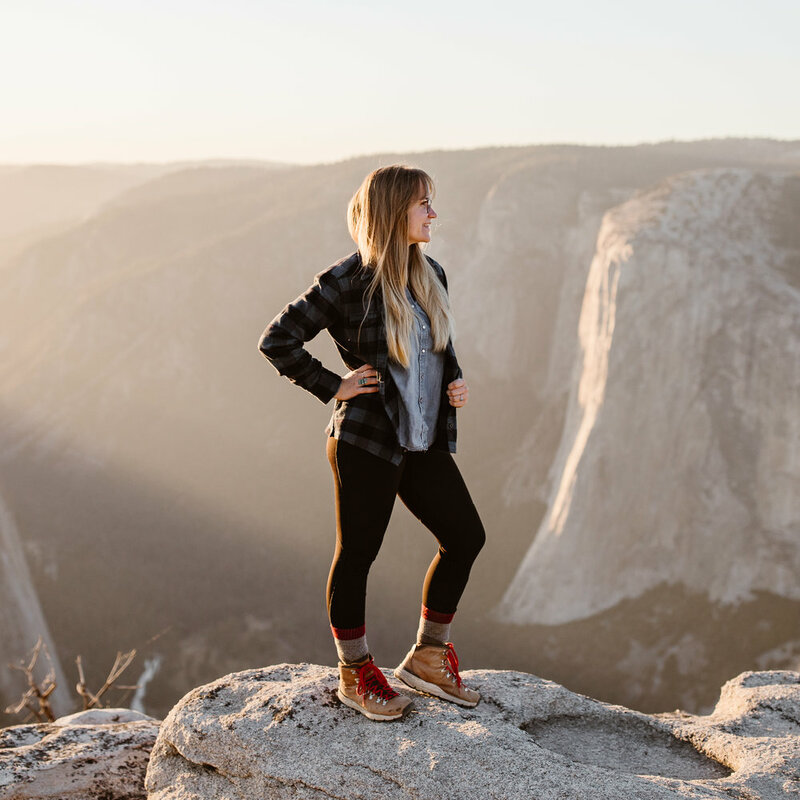 We DONATE a percentage of proceeds back to protecting public lands!